I'm so excited! After months thinking about it, I've finally published the content marketing guide I've been dreaming about since before Bathroom Blogfest and Hurricane Sandy. The guide came out of several blog articles published here on Content Talks Business and many requests from business owners wanting guidance on how best to embrace content marketing for their business. The end result is a 12 page guide which outlines what I consider to be the major pillars of content marketing: personas, keywords and the buying cycle. I invite you to download this Content Marketing Guide [note: you will need to complete a form] and read the guide. Tell me what resonates most for you and your business. Let me know what you consider easiest to implement, and what you would do differently given your industry and business dynamics. I believe that content marketing is relevent to all businesses, regardless of industry. It represents an opportunity to educate prospective customers without using hard sales techniques. It means that your digital presence can truly support your business objectives regardless of business hours and location. It amplifies your marketing - when done correctly with the end customer in mind. 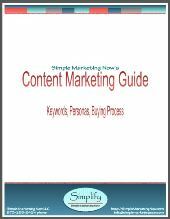 This content marketing guide offers fundamentals so you can get started and be successful. Thank you for downloading and reading. I look forward to hearing from you!